Combining this (and the other Gugs in general) with Khopesh seems very strong. Wound one of your characters and I get a card? Deal! Card draw is always nice, as long as you can find ways to wound him you are getting good value. Automatic x3 in a Gug deck, worth a look in others but probably doesn't make the cut. 3 combat icons means you're probably going to have to find an unconventional way to found him. The obvious answer is Khopesh, but that locks you into a second faction. That's not necessarily a bad thing, since Flooded Vault can yank out some of the Gug synergy supports, for instance. Alternately, you can get Small Price to Pay going, but that's less reliable and non-repeatable. Card draw is always nice, though. There are lots of ways to wound your own characters but to get the most use out of toughness you want to wound as many characters as possible at the same time, like using catastrophic explosion to clear the board of anything that is not a gug. Strangely the best card that combos with gug's is Mu from the MU faction, currently the only repeatable wound removal card in the game. Can someone please confirm that I'm understanding this and most of the other purple Gugs correctly? My understanding is, under typical circumstances, I'll get to trigger Laboring Gug's ability twice. His ability is self-referential, and it is in response to an effect that either 1) destroys him, or 2) causes him to be destroyed (such as a wound, in this case). I'm pretty sure I read that previous sentence somewhere in an FAQ, but I just wanted to verify with you smart people that I'm interpreting this card correctly. Incidentally, I just put Slime Mold into my Gug deck. I'm trying to make sure that if I trigger the Slime Mold's ability, all my beautiful Gugs won't be killed without all of their abilities triggering a second time. Oh, and yes, I did say "beautiful Gugs." Thanks in advance! The response trigger is a wound to Laboring Gug. No more, no less. It doesn't matter whether that wound destroys him or not. If he is destroyed without being wounded, he doesn't get to use his ability. Wounds in excess of Toughness destroy. But there are other ways to destroy characters, such as the Silver Twilight event Pose Mundane, which just "destroys" a chosen monster without wounding it. Also, if your previously-wounded Gug goes insane, it is destroyed, but that won't trigger the ability. Yes, I understand all that. It sounds like you agree with me then that even a fatal wound won't prevent the Gug's ability from triggering one last time before he's gone. EDIT: For those following this thread, I just found the FAQ ruling I was looking for. It's on the Gustaf Johansen page, and it indeed confirms the whole "self-referential" and "response to leaving play" issues. 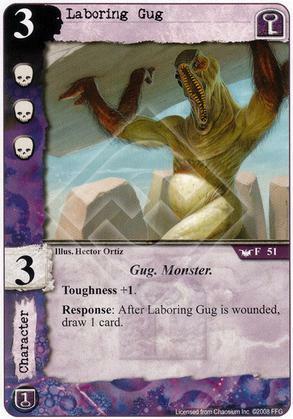 The Laboring Gug situation is messy, but in summary I believe with high confidence that you do not get to draw a card when it takes fatal wounds. 1) You don't generally get to run a response if you have left play before you can run it. Fatal wounds means the Laboring Gug will be in the discard pile before his effect can trigger. 2) There is an exception in the rules to support certain card effects, but that exception doesn't apply here. Note that point (2) is contentious and there seems to be conflicting evidence around. I personally believe that the relevant portion of the FAQ is badly worded. I think the exception is intended for cards that need the exception to make any sense at all, and that the current official rulings stem from that intent rather than from the current wording, which if true is obviously not ideal. Still, it has currently been advised that for the purposes of the leaving-play-response-exception that "wounding is not considered an effect that causes a character to leave play;". This leads to confusion since it clearly contradicts other rulings in fairly comparable situations (eg FAQ entries for Matthew Alexander and Andrew Chapman - where a card effect dealing lethal wounds is considered to have destroyed the target). But sadly perfect wording and fully coherent rulings is not something the elder forces have granted us. Wow. I don't know what to say. That's like when Bill Clinton said "that depends on what your definition of the word 'is' is."